The Tibetan opera is one of the oldest drama forms among China's minority nationalities. For hundred of years it has been performed in Tibet as well as in Sichuan, Qinghai, Gansu and Yunnan provinces - wherever there are large communities of Tibetans. Tibetan arts are just as appealing as Tibet scenery attractions. Its origins may be traced to the 8th century when the Tibetan king Chisongdezan (742 - 797), a devout Buddhist, invited the eminent Indian monk Padma Sambhava to preach and teach in Tibet. In 779, Padma Smbhava composed a ritual "sorcerer's dance" to greet the completion of Samye Monastery. Based on a story from the Buddhist sutras, it embodied local folk dance movements and was performed to exorcise evil spirits and propitiate the gods through a kind of pantomime. It is considered as the precursor of Tibetan opera. Some six centuries later a lama called Tangdong Jyalbo (1385 - ? ), put on performances of this dance to raise funds to build a bridge. To make it more interesting and religiously instructive, he interlaced the original form with episodes from folk tales and the Buddhist sutras. This dramatization, in which songs were added to dance, gained immense popularity among the local people. Hence Tangdong Jyalbo became known as the founder of Tibetan opera. Later still, the fifth Dalai Lama (1617 - 16882) decreed that Tibetan opera should be performed separately from religious services. Thus it became an independent art form. Although linked to religion in its birth and development, it was rooted in the people and their life. 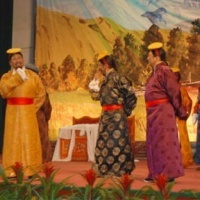 The melodies used by Tibet's earliest operatic ensemble, the Bundunba (Seven Sisters) Troupe, were very similar to those of the folk songs known as "Xaiqen" (see Tibetan Folk Songs). 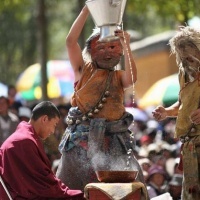 The instrumental music is closely related that of the Tibetan tap-dances, drinking songs and gorxai (round) dances. Of the dances movements (see Tibetan Dances), many originated from the people's everyday experience. This may explain why Tibetan opera has survived, with unchanged popularity, for centuries. Performances used to be given in the open to the accompaniment only of a drum and a pair of cymbals (See Tibetan Drums). The melodies, high-pitched and resonant, were sung with choral backing, giving an effect both robust and harmonious. 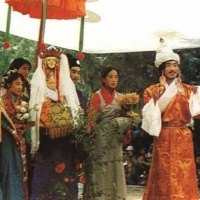 Each traditional opera consisted of three parts: The Doin, the Xong and the Zhaxi. In the Doin, or prologue, a narrator called the Ngoinba (hunter, or fisherman) first offered prayers of thanks to the plot and the characters, often to the accompaniment of dance movements. The main body of the opera was called the Xong. The performers came out and stood in a circle. The performance master, usually the same person as the Ngoinba, explained the plot, scene, setting, characterizations and lyrics in a rhymed monologue. At appropriate points in the story, the appropriate actor would leave the circle his or her lines, then return to the circle and dance or do acrobatics with the others. This alternation went on till the end of the show, which could last anywhere from two or three hours to three days, at the discretion of the performance master. The last part was the epilogue, or Zhaxi, which in Tibetan means blessing or good augury. Singing benedictions, the performers did a joyous dance, and then presented the audience with hadas (ceremonial silk scarves) to conclude the performance. 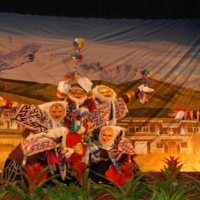 The chief media of expression in Tibetan opera are: song, dance, rhymed monologue, recitation, acrobatics and acting. Most important is the singing. Each traditional opera had its own main melody or theme, which remains consistent throughout. For each character, too, there was only one melody, longer or shorter as situation demanded. The opera might use another melody, such as a dirge or folk song, common to all the characters, but not more than one. Dance and acrobatics are also usually had little connection with the plot or the feelings and emotions of the characters. They were meant to set off the theme by contrast, or by varying the mood and thus help push the drama to a climax. Some denoted specific actions such as marching or horse-back riding. The actors would occasionally break into folk dance movements as they sang. Rhymed monologues were generally reserved for male characters of high social position, the cadenced speech being meant to create a feeling of dignity and prestige. Recitation was both in metered verse and ordinary speech. Metered verse in the Tibetan language calls for a strictly defined number of words or sentences per stanza. Acting in the old Tibetan opera relied heavily on masks and gestures. The only exceptions were the clowns, with their lively warmth and humorous facial expressions. Today, masks are no longer employed by any of the characters unless essential to the plot, and emphasis on facial expression has made the opera more vivid and moving. As for the plots, most were taken from stories and biographies in the Buddhist sutras, or on folk tales. Thirteen traditional operas are still extant today, of which only eight are frequently performed. Though unsophisticated, the plots are often beautiful and touching. Traditional Tibetan opera was widely popular and troupes were numerous. As many as twelve used to be officially designated to act during each year's Xodoin festival. Amateurs performed in the rural areas, on street corners and in monasteries or temples. Each troupe had its own style and character. Broadly, there were tow main schools – the white mask and the blue mask, so named for their attire. The former was of earlier origin, its presentations were quite simple and its influence gradually waned. The blue mask school which came later was more sophisticated, and its four largest troupes enjoyed wide renown. Most prestigious was the Gyumolong ensemble. 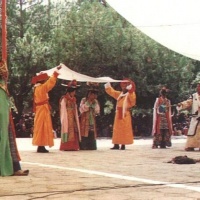 The Tibetan Opera Troupe of the autonomous region was set up in 1960. It shifted the locale of this traditional art form from public square and streets to the regular stage, adding to it the benefits of the make-up room, stage props, lighting effects and orchestra. As a result, it is fast becoming a well-rounded drama form.